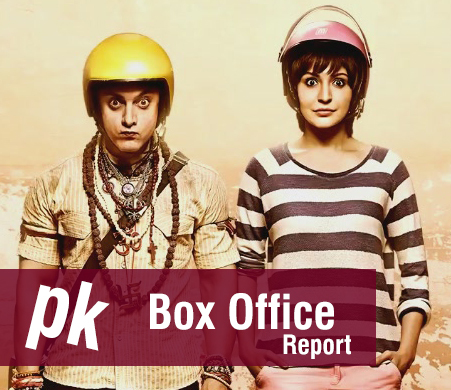 Aamir Khan starrer latest Bollywood movie PK was released this Friday amidst highly positive timing near Christmas and New Year occasion i.e. 19 December 2014 and finally it stepped into the screens by this date and getting immense love and support by spectators. The movie is basically a complete entertainment package and has done with its first three days on box office. Film was set to be released on about phenomenal number of screens around 6000 screens all across the world in various languages. Aamir Khan is seen in cute role while peppy Anushka Sharma and Sushant can be seen in significant roles. It is made hilarious performance by the end of its first weekend and has done a tremendous trade in 3 days. Where Friday was powerful, Saturday came to be more profitable and at last Sunday stands at highest grosser among first weekend time. PK has also not got that competition as it released on the screen with no Bollywood movies as the options i.e. Action Jackson, Lingaa and Exodus have already been seen by the viewers. 1st Weekend Performance Chart of PK shows that the trade done by the movie on its first weekday is on the top of all the movies recently and is surely a record breaker. Friday being the opening time film gathered around 26.63 Crores whereas Saturday brought good growth over first day and ended up with 30.34 Crores. At last Sunday remained the highest grosser of first weekend by earning increased occupancy & figures of 38.44 Crores making total first weekend collection of 95.41 Crores. As film has been released on too large number of screens globally and expected to break all possible records of previously biggies of Bollywood, but its earlier days business are supporting it in that way and this movie might end up with some shattering figures if reports are to be believed which are entirely based on certain facts.